THE TEENAGE ACTOR who plays the half in the hit CBS comedy Two and a Half Men has said in a says in a video posted online by a Christian church that the show is “filth” and that viewers shouldn’t watch it. Nineteen-year-old Angus T. Jones has been on the show since he was 10 but says he doesn’t want to be on it anymore. Jones plays Jake, the son of Jon Cryer’s uptight divorced chiropractor character, Alan, and the nephew of Charlie Sheen’s hedonistic philandering music jingle writer character. Charlie Sheen, who has publicly criticized CBS, was fired and replaced by Ashton Kutcher, who plays billionaire Walden. In the video posted by the Forerunner Christian Church in Fremont, California, Jones describes a search for a spiritual home. He says the type of entertainment he’s involved in adversely affects the brain and “there’s no playing around when it comes to eternity”. You cannot be a true God-fearing person and be on a television show like that. I know I can’t. I’m not OK with what I’m learning, what the Bible says, and being on that television show. “Two and a Half Men” survived a publicity crisis less than two years ago, when Sheen was fired for his drug use and publicly complained about the network and the show’s creator, Chuck Lorre. Sheen later said he wasn’t still angry at the sitcom’s producers and the network and acknowledged he would have fired himself had he been in their shoes. It’s the third most popular comedy on US television behind CBS’s The Big Bang Theory and ABC’s Modern Family, and it broadcast on RTÉ 2 on Monday evenings. The actors on “Two and a Half Men” have contracts that run through to the end of this season. Ashton Kutcher wants to be a space cadet? 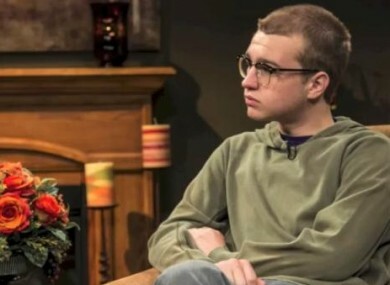 Email “'Two and a Half Men' teen calls show "filth" in religious interview ”. Feedback on “'Two and a Half Men' teen calls show "filth" in religious interview ”.